EC has won 5 awards at OETC Annual HSE awards ceremony held at OETC HO. The awards were presented by Chief Operations Officer - OETC to various successful contractors and consultants, in the ceremony attended by all leading contractors and consultants in Oman. BEC’s HSE performance was rated best among all the 11 local and international EPCs. 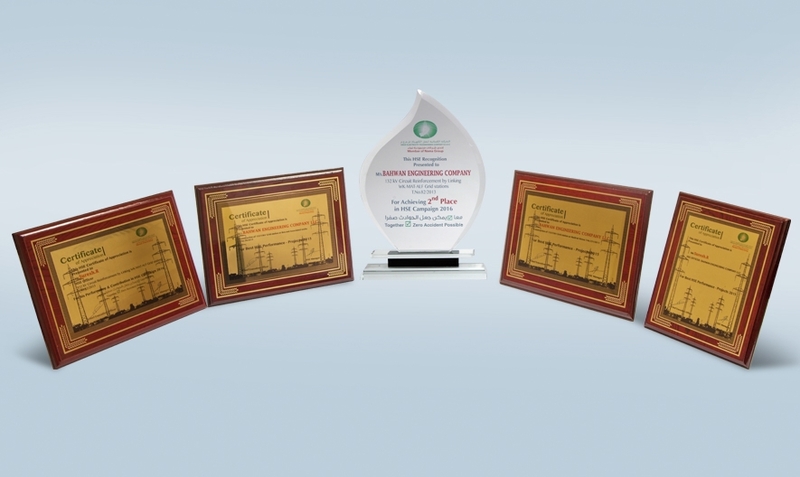 BEC won awards in all the categories applicable for contractors as follows. BEC won two out of three awards for Nizwa 132kV grid station and Ibra 132kV Grid station. BEC achieved second place for Wadi Kabir Mutrah 132kV Grid substation project HSE campaign conducted in the first week of March 2016. All the two awards for best HSE officer were bagged by BEC for Ibra and Wadi Kabir projects. The achievement is an appreciation for the commitment and efforts of BEC to exceed the expectations of our clients.